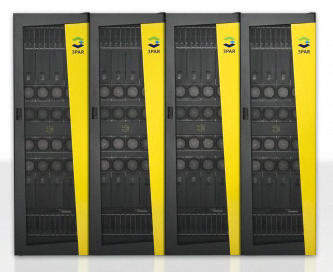 I recently deployed 3PAR P10000 model V400 InServ Storage Systems as back-end storage for VMware vSphere 5. The P10000 provides tremendous advantages over many other storage products, including hardware-based thin provisioning, ultra-wide striping, and adaptive optimization, which especially benefit virtualization. 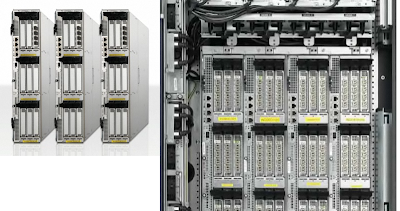 The P10000 architecture consists of controller nodes which are deployed in pairs (up to two pairs in the V400, and up to four pairs in the V800), which are connected together via a full-mesh backplane. The controller nodes can be populated with up to nine four-port 8Gb Fibre Cannel adapters, which can be configured as disk ports (connected to disk shelves) or as host ports (connected to your SAN). That's a lot of ports, which translates into the ability to attach many disk shelves and many hosts, for tremendous scalability. At the heart of the controller is the 3PAR ASIC, a specialized chip that performs RAID operations, thin provisioning and other functions at the hardware level. Many other storage vendors perform these types of operations at the software level, reducing overall performance. The disk shelves (cages) hold up to 40 drives each, which are mounted on 4-drive magazines that are inserted into ten slots per disk cage. Each cage is then connected to a controller pair through dual redundant fibre connections. Depending on the model, the primary rack (the one containing the controllers) can contain up to two disk cages (V800) or up to six disk caged (V400). Additional racks can be added, containing nothing but disk shelves. Each disk shelf in the additional racks are connected back to the primary rack through a pair of fibre cables, allowing significant distance between the racks, up to about 50 meters. 3PAR does away with the traditional RAID set. Rather than striping data across disks, it stripes across blocks of disk space called chunklets. Data is striped across chunklets, not disks. And chunklets are provisioned from all of the disks (of a given disk type) in the system. This means that a volume provisioned from the 3PAR is striped across all the disks (of a given type) in the system, providing massive IOPS. The 3PAR can contain three types of disk, SSD, Fibre Channel, and SATA. Typically, storage volumes are initially carved out of FC disk, which provide good performance, and moderate capacity. Then, using Adaptive Optimization, blocks of data that are hit hard can be moved to SSD for higher performance, and blocks that are rarely hit can be moved to SATA, thus freeing up valuable space on FC disks. This technique also ensures reduced activity on the SATA disks, thus reducing the failure rates associated with SATA. Thin provisioning means that physical disk space on the 3PAR is not used until data is actually written. When a volume is created, very little space is actually used. Often, allocated space is never filled up, typically 33 - 66% of the space is ever used. By using hardware-based thin provisioning, that left-over space translates into disk that you never have to purchase. Over-provisioning can be a hard mentality to get used to. Allocating more space to your hosts than you actually own can make you a little nervous until you realize that the space just never gets used. However, as you watch the allocation over time, you'll see the reality, the tremendous cost savings, that thin provisioning provides. In addition, the 3PAR ASIC can detect and remove repetative zeros in the data stream, which further thins the data, and significantly improves performance by eliminating the disk reads and writes associated with those zeros. From an Architect's point of view, the point of server virtualization is cost savings. This savings is achieved by putting your server workloads onto a smaller number of larger servers, thus allowing your workloads to share CPU, memory, and network resources. 3PAR storage does the same thing for storage by consolidating available disk capacity and performance through thin provisioning and wide striping. Native VMware storage drivers work perfectly with 3PAR, so no additional software or drivers need to be installed in order to do round-robin path selection, hardware-assisted locking, and other advanced array integration (VAAI) features. There is a plug-in for vCenter called 3PAR Recovery Manager for VMware, which allow you to manage LUN snapshots from within vCenter. Any VMware administrator running a well loaded environment will know that of all the resources (CPU, memory, network and disk), memory and disk IO are the limiting factor when trying to achieve maximum VM density on your hosts. Assuming you have enough memory, disk IO often becomes the ultimate bottleneck. The performance characteristics of 3PAR storage allow more VMs per host, therefore improving ROI of your entire VMware environment. How about replicating two of them in sync replication? Did you test it? We have two of them V400 and in replication without doing some tricks with hba for RCFC the perf are not so good! Unfortunately I didn't have the chance to perform replication testing. I'd definitely recommend getting HP to update the software on the box to the latest versions and see if they can't get it working as expected.